Synopsis from the book's dust jacket: Meet Rachel White, a young attorney living and working in Manhattan. Rachel has always been the consummate good girl - until her thirtieth birthday, when her best friend Darcy throws her a party. That night, after too many drinks, Rachel ends up in bed with Darcy's fiancé. Although she wakes up determined to put the one-night fling behind her, Rachel is horrified to discover that she has genuine feelings for the one guy she should run from. In her wildest dreams (or worst nightmare?) this is the last thing on earth Rachel could ever have imagined happening. As the September wedding date nears, Rachel knows she has to make a choice. In doing so, she discovers that the lines between right and wrong can be blurry, endings aren't always neat, and sometimes you have to risk all to win true happiness. 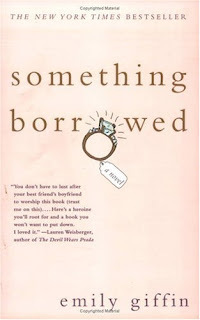 I'd had Emily Giffin on my TBR author list for quite awhile, but when I saw the previews for the movie Something Borrowed, it reminded me, so I bumped her to the top of my list and picked up a copy of the book. It's been a really long time since I've read a chick lit book, and I forgot just how great they can be. This book was great. I could relate to Rachel in so many ways (except for the whole cheating with your best friend's fiancé thing). I have my own Darcy - someone I've been friends with most of my life who has screwed me over countless times, but for whatever reason, I still love her. If you've ever had a friend like that, you'll know what I'm talking about. They're the kind of friend who, when you think of your past together, think of all the things they've done to you and the ways they've hurt you, you might stop and wonder why you're actually friends with them. And yet, despite all the crap they put you through, there's just something about them that prevents you from staying away from them or ending your friendship with them. They're a lot of fun, you have a lot of history together, and because you've had good times, it can be easy to gloss over the bad times. This is the bulk of what Something Borrowed is about. Rachel slept with Darcy's fiancé Dex, but instead of feeling guilty when she knows she should, she goes through her history with Darcy and discovers why she doesn't feel guilty, and why it is that people say there's a fine line between love and hate. I love how Rachel thinks over her past with Darcy, bringing up memories - some long forgotten - as evidence of sorts that although Darcy has always been her best friend, she's not really a good friend. She's too self-centred to be a good friend - she's selfish and bossy, loves to be the centre of attention, and isn't above lying and cheating to get what she wants. Rachel realizes she's been a doormat to Darcy her whole life, and has taken her abuse without saying a word or standing up for herself. It takes Rachel turning 30 and doing something she would never do - sleeping with her best friend's guy - to see the truth, not only about Darcy, but about herself as well. Rachel is a great character. I loved watching her change and develop through the story. Her inner turmoil was so real - anyone who's ever had a friend like Darcy, or wanted a guy like Dex, or watched a guy they like with another woman - will relate to Rachel's emotions. You can feel her hurt and anger, but you can feel and revel in her triumphs, too. You empathize with her, even when she's being slightly irrational. I found myself nodding a lot, relating to many things she said or did, or tales of her friendship with Darcy, thinking something similar had happened to me, or her reaction was how I would react, etc. I would definitely recommend this book, especially if you're looking for a great summer read. I was looking forward to seeing the movie before, but now I want to see it even more! 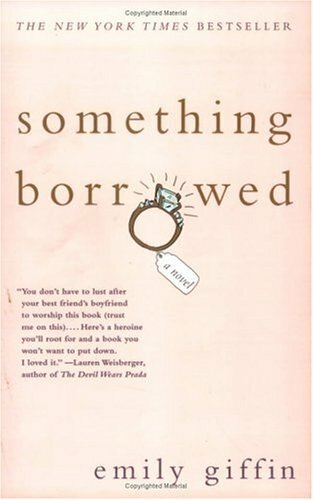 Have you read Something Borrowed? What did you think? Have you ever had a friend like Darcy? Do you plan on seeing the movie? I read this one a few years ago and I remember that I didn't think I was going to like it based on the synopsis. Lots of people told me it was good so I read it anyway and I'm really glad I did! Like you, I found I could relate to Rachael and I think most women have a Darcy-ish friend, even if not to her extreme. I haven't seen the movie yet, but I've heard it was a good adaptaion of the story! I really need to pull this out and read it soon. I hope to read it before I see the movie. I have had a friend who has hurt me many times(not in the way I think Darcy has) but she is fun and really can't help herself for the most part. It's just part of who she is. This is one of the best chick-lit books ever. The follow-up "Something Blue" was almost as good. The story focuses on two lifelong best friends, Rachel and Darcy. The first installment is told from Rachel's perspective; the second book is told from Darcy's perspective. Very clever.